Adriana Montano is fundraising to start a cafe where you can drink coffee and pet cats. You’re sipping a latte and reading a book, a cat curled up in your lap. The setting isn’t your living room – it’s a coffee shop in Palm Beach County. But if you fall in love with your new feline friend, it can come home with you. Called a “cat cafe,” the concept is a cross between an animal shelter, a petting zoo and a coffee house. It got its start in Asia, spread to Europe and is beginning to catch on in the U.S. Now a Boca Raton woman is working toward opening one here. “This is a great way to give people the chance for some fur therapy,” said Adriana Montano, 29, a former advocate and fundraiser with Alley Cat Allies, a national nonprofit aimed at protecting and caring for cats. The self-described “cat lady” has started a fundraising campaign online and partnered with Tri-County Animal Rescue League to bring her idea to life. Gato Cafe, as she calls it, would be located somewhere in Delray Beach or Boca Raton. Katherine Miller, a behaviorist with the American Society for the Prevention of Cruelty to Animals, said she feels “cautiously optimistic” about the premise. “I think it could potentially be a great way to showcase adoptable cats that are very outgoing and like to interact with people,” she said. It was the purr-fect combination. Cats and coffee were paired last weekend at Toronto’s first pop-up cat cafe. Hundreds were scheduled to enjoy the event held on the top floor of RedFish BlueFish cafe on Harbord Street. Hosted by Pet Me Meow, a new initiative between entrepreneurs Jeff Ro, from Regent Park, and Ashkan Rahimi from North York, in partnership with the Toronto Cat Rescue, the idea was to provide a space where cats up for adoption could socialize and possibly meet their future owners. “I’ve always loved cats. They mellow me out a bit,” said Ro, who adopted his own cat from Toronto Humane Society. Ro and his business partner both enjoy looking for startups and were following a lot of the cat cafes in Asia. One of the newest ones in London, England, had amazing reception in the city, Ro said. He figured Toronto needed something like it. “You go online now and it’s all cats. Cats are in funny, cute and stupid things, but there is real homelessness and ultimately cat euthanasia in the city,” he said. He said he hoped the pop-up would provide a glimpse into what a cat café in Toronto could be like, and bring awareness to those who’ve never considered adopting a pet, or aren’t able to due to living circumstances. As Ro predicted, the response was overwhelming. Within 48 hours, nearly 80 per cent of appointments were sold. Before opening early Friday morning, two cats were already adopted while by the time the event ended, eight of the nine were adopted. Cat lover Emma Ichikawa was one of the first hour-long appointments Friday. She was visibly excited to see the nine kittens in the space. Ichikawa visited a cat café in Japan while living there and found it to be an interesting experience. After receiving an email from Toronto Cat Rescue she figured “I got to get on this,” she said. “If you’re thinking of getting a cat it’s really good hands-on experience that would help you make that leap, or maybe show you that it’s not for you,” Ichikawa said. She wasn’t planning on adopting any cats at the café, but said there are two cats on the Toronto Cat Rescue website she’s considering. “I adopted kittens last time so I’d like to adopt older cats. Spread the love,” she said. As for the future of Pet Me Meow, Ro and his business partner have set their eyes on a permanent location, most likely in the west end. Multiple locations, however, aren’t off the table. “We want to be the best,” Ro said. There is a Pet Me Meow Indiegogo campaign to help launch the first space. Their goal was $70,000 and they reached $10,536 by the time of press deadline Tuesday. PetMatch runs image-recognition technology to match pictures of animals, selected by prospective owners, to an “adoption database”. 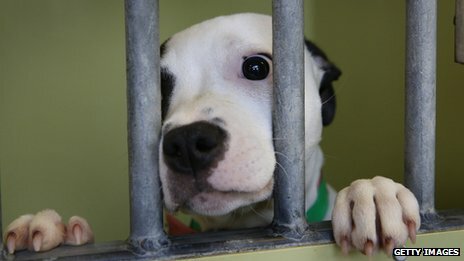 The London rescue centre stressed that people should also research the animal’s temperament before adopting. The developers of the app pointed out that users were still able to carry out further checks before they took an animal home. Users either upload pictures of their ideal pet to the app or use a pre-loaded image. 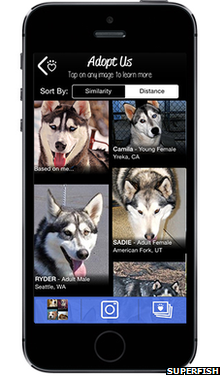 The app then uses image recognition technology to find matches among a database of animals that are up for adoption. Mr Young said that it would be possible to find identical matches but warned prospective pet owners to be careful. The developers, California-based Superfish, said their algorithms allowed the app to analyse pictures with “no human involvement”. The company, which has been backed by five different venture capital firms to the tune of $19.3m (£11.4m), said PetMatch was a “faster, more intuitive way to bring you closer to finding exactly what you’re looking for”. It added that the app helped users get in contact with pet-adoption agencies, once they had found the pet they are looking for. But Mr Young said that, while he understood why some people would find the app useful, he would advise people using it to “find a dog or cat that looks identical to their old one” to proceed with caution. “[Owners] become incredibly attached to their pets. I own two terriers and I would probably look to get another if one passed away,” he said. Superfish’s head of communications Alisa MacDonnell said that using the app was “just the beginning of the conversation” and said users needed to meet an animal before adopting it. London, May 13 (IANS) Cats and dogs at home can also get infected with MRSA bacteria – a type of staph bacteria that is resistant to antibiotics – that is genetically similar to the type of MRSA that occurs in humans, an alarming study has revealed. A shared population of methicillin-resistant Staphylococcus aureus (MRSA) bacteria circulates both in humans and companion animals. “Humans and pet animals readily exchange and share MRSA bacteria from the same population,” warned Mark Holmes, a senior lecturer in preventive veterinary medicine at University of Cambridge. MRSA naturally lives on the skin and also causes difficult-to-treat infections in humans and animals. Holmes, however, said pet owners do not need to worry. “MRSA infection in cats and dogs is still extremely rare. There is very little risk of owners getting ill from their pets,” he added. In addition, healthy pets are not likely to pick up MRSA from their human companions but if a pet already is ill or its health is severely compromised, MRSA patients should inform their pets’ veterinarians. Holmes and colleagues sequenced the genomes of 46 MRSA samples from cats and dogs. The samples were found to be similar to those associated with MRSA strains in humans, with most coming from wound infections or skin and soft tissue infections, the study noted. Nearly all samples were genetically similar to human bacteria, and their place in the family tree showed that the companion animal bacteria most likely originated in humans. It’s a reminder that constant vigilance and high levels of hygiene are just as important when treating cats and dogs as with humans, Holmes noted in a paper published in the journal mBio. London: Two people have been infected with tuberculosis from pet cats that might have ventured into badger setts in the first recorded cases in England. Two further people have contracted the mycobacterium bovis infection but have not shown any symptoms. The incidents are linked to nine cats found to have the infection at veterinary practices in Newbury, Berkshire, according to Public Health England (PHE). The two patients who developed the disease were responding to treatment. Veterinarians believe that domestic cats could be catching the disease by roaming into badger setts or from rodents that have been in badger setts. The public health body says transmission of the bacteria from infected animals to humans can occur by inhaling or ingesting germs shed by the animal or through contamination of unprotected cuts in the skin while handling infected animals or their carcasses. She said she had dealt with cases in which dogs had also passed on mycobacterium bovis to humans. Nine cases of mycobacterium bovis infection in domestic cats in Berkshire and Hampshire were investigated by the Animal Health and Veterinary Laboratories Agency and PHE last year. PHE said it had offered TB screening to 39 people identified as having had contact with the nine infected cats. Of these, 24 people accepted screening. Two were found to have active TB and two cases of latent TB were detected, which means they had been exposed to TB but did not have an active infection.